Welcome to Cypress Bend Apartments in Beaumont, Texas! At Cypress Bend Apartments, you will find the perfect one or two bedroom floor plan to suit your lifestyle. Our apartment homes feature well-equipped kitchens, large walk-in closets and an in-home washer and dryer. We believe in the importance of community and offer a playground and picnic area with barbecue grills. Schedule your personal tour with our team today! 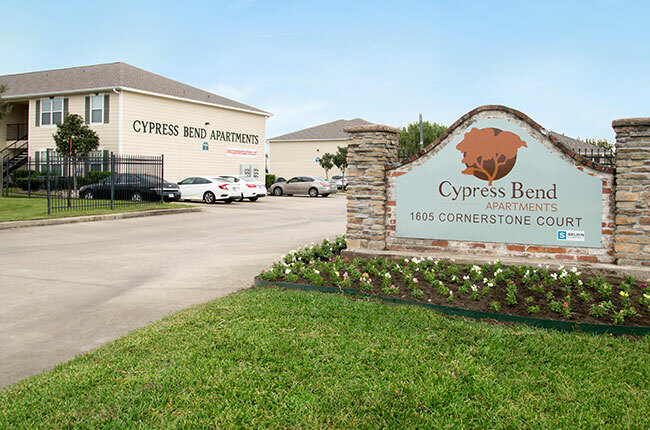 Cypress Bend Apartments is pleasantly settled in West Beaumont with peaceful, serene surroundings. Go for an invigorating walk or run along any of the hiking and biking trails. Gulf Terrace Park is located right down the street. The excitement of Downtown Beaumont is an effortless car ride away. Our community has easy access to Highway 105 & 90, as well as Interstate 10. Cypress Bend Apartments is a dream for anyone looking for a cosmopolitan lifestyle coupled with the comfort of a cozy community. Map of Beaumont, TX which includes a marker with additional information about Cypress Bend. The address is 1605 Corner Stone Court Beaumont, TX 77706.